‘The Perspective of a Real Journalist’ Matt Kaminer '18 stepped outside his comfort zone to work on some big stories during an internship with the Charlotte Observer. 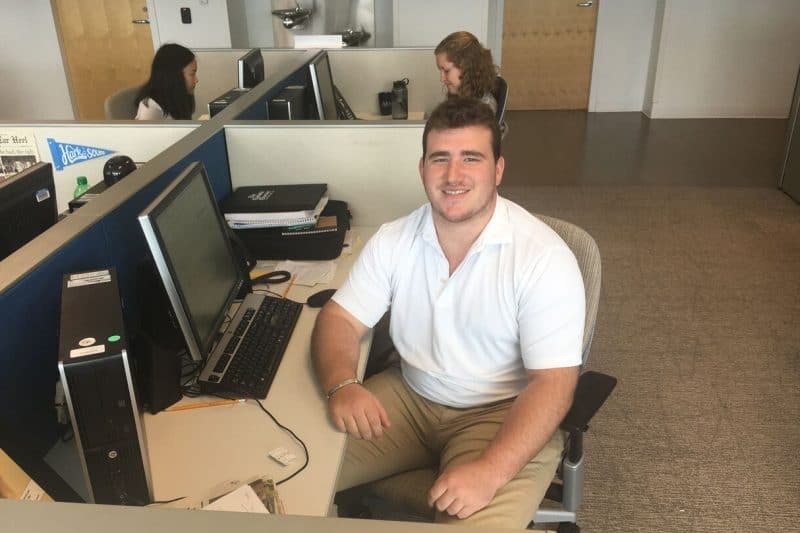 Matt Kaminer ’18 on the job as a summer intern at the Charlotte Observer. The Charlotte Observer, in Charlotte, North Carolina. I was fortunate enough to receive a Reynolds Scholarship for Business Journalism from our department, which made the decision to work far from home possible. Tell us a little bit about that organization. The Observer has a great tradition in Charlotte as a go-to source, both for timely breaking news and quality long-form stories. There are 50 or so employees. The internship program was very well organized and structured for the interns to get as much out of the summer as possible. Once a week, the 10 interns would meet with a crew of editors to highlight some of the best work from the interns in that week. I worked as a Business News intern, but I also got to cover some local/metro news and even a few sports stories. The business staff is small so I was able to involve myself in the regular workflow of the business desk and develop relationships with my co-workers. One thing I learned this summer was that business can take on many different meanings; I covered stories about banks cutting work-from-home jobs, economic growth in Charlotte, and protests of local government and real estate development. I also got to take on some enterprise pieces, such as a profile of a high school graduate who is the youngest of 13 siblings. I found myself frequently chatting with economists and financial analysts at the top of their fields. The Observer brand empowered me to open doors with sources with whom I might not normally have had the opportunity to talk. The best project I worked on was one that I couldn’t even really put my name on. In my first week in Charlotte, a co-worker was working on a story looking into government records of pool inspections and asked for my help. She was suspicious that the local health department was giving permits to pools that, in reality, had serious safety issues, including loose electrical wires and contaminated water. We spent hours sifting through the online inspection database, comparing current pool permits to the list of pools that were denied a permit last summer. I made calls to hotels and apartment buildings to elaborate on the information found online, then crunched numbers on which pools could be unsafe to use. We ultimately published a story right around Memorial Day weekend, just before pool season began. Weeks later (after the Observer published other stories about the health department), the health director resigned. Although I can’t take credit for the outstanding work my co-workers did, it was nice to be a part of a project that had tangible real-life significance. It didn’t matter whose name got put on the story, as long as we got the job done. In my opinion, we did. Before arriving in Charlotte, I made it a goal of mine to connect with my co-workers not just as reporters, but also as mentors to whom I could go for advice. Early on in my internship, Fred Kelly, a reporter on the Observer’s investigations desk, introduced himself to the interns and made it known that he’d be happy to answer any questions, help with a story or just grab lunch sometime. Fred would always come around the intern section of the office just to chat, and quickly we noticed that we were both into basketball. Before long, Fred and I began taking our lunch break to go to the local YMCA and play basketball twice a week, as long as we weren’t on deadline. Having co-workers that cared not only about my work product but also about my summer experience really made my time at the Observer enjoyable. On my second day in Charlotte, my editor sent me out to a low-income housing development a few minutes from the newsroom called Brookhill Village. We had heard that the village’s owner was going to knock down some of the homes, so my goal was to learn more about the dilapidated conditions of the village and find out what people were going to do if their homes got destroyed. However, we had no concrete sources, so my job was to basically walk around the village, go up to residents and ask them about their lives. Before coming to the Observer, I deeply feared these “man-on-the-street” assignments. But before I left the office for Brookhill, one of my co-workers sat me down and told me to treat these opportunities like lifting weights: they’re not always fun, but you can only get better at them by continuing to try them. Once I got to the village, I dropped any insecurity I might have had before, and I knocked on dozens of homes, hearing tragic story after tragic story from these hard-working people. The Brookhill Village piece taught me how to report outside of my comfort zone; it wasn’t easy, but I definitely improved as a journalist that day. I really enjoyed working right in the middle of Uptown Charlotte. My desk gave me a clear view of Bank of America Stadium (where the Carolina Panthers play) and the Observer newsroom is in the same building as the NASCAR Hall of Fame. Nicknamed “Banktown,” Charlotte is home to the Bank of America headquarters as well as Wells Fargo’s largest employee base. Seeing those offices as I walk through the city each day was a pleasant reminder that the topics I covered as a business reporter are ingrained in the city’s culture. My current plans are to attend law school and hopefully work in a legal capacity for newspapers or other media organizations, working to protect the rights of journalists to report on the observations they make every day. Interning at the Observer gave me the perspective of a real journalist that I hope to maintain as an attorney. During my internship, the Observer also had its media attorney give a guest lecture to the interns. He explained to us how he has switched back and forth between the newsroom and the courtroom throughout his career, and hearing that really confirmed for me that the skills I sharpened this summer will serve me well in the future. Our professors prepare students not only to produce high-quality content, but also to transition seamlessly into a professional setting. Taking Beat Reporting last fall gave me experience in working with an editor, pitching stories, interviewing sources and asking “the extra question,” skills that I called upon daily as an Observer intern. Professor Swasy’s Reporting on the Economy class, which I took last winter, helped mold my skills for a business environment, teaching me how to take a commerce-oriented angle on even the most routine story.